CLASSIC Enjoy an afternoon excursion to Gouda. You’ll join a Guided Tour of the town famous for the Dutch yellow cheese that bears its name—as well as stroopwafels (syrup waffles), Gouda candles, and the beautiful city center. DISCOVERY This evening, enjoy an onboard food and beer pairing dinner hosted by your Beer Expert Later, enjoy live entertainment on board. 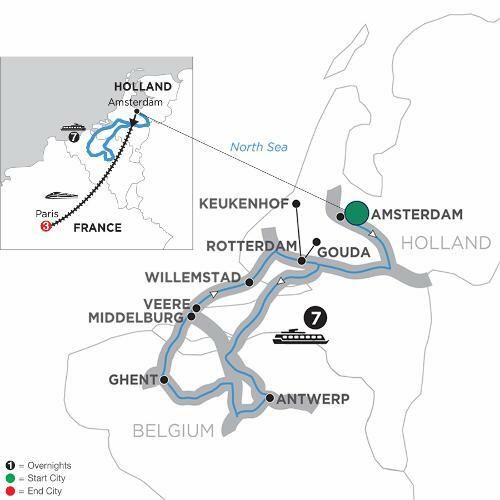 DISCOVERY Later, enjoy a Beer & Cheese Tasting on board hosted by your Beer Expert as you prepare to sail to Amsterdam. DISCOVERY Explore the iconic waterways of Amsterdam on a Guided Canal Cruise past stately homes of Amsterdam’s “Golden Age.”, followed by a real Dutch beer experience. Next, sail to Antwerp, Belgium’s second-largest city, combining ancient buildings and monuments with modern architecture, where you will get to know the famous Belgian beer in a local brewery. Join a guided tour of Ghent, including a visit to St. Baaf’s Cathedral, or alternatively, a canal boat will take you to a brewery where you will find out how the local beer is produced. Back to Holland visit Middelburg. No trip to Holland is complete without a visit to the technical miracle that is the Delta Works, a storm flood barrier almost six miles long. Back in Amsterdam, see the most fascinating areas of the city on a canal cruise along the elegant grachten and do not miss the opportunity to taste some of the Dutch beers. A Beer Expert will travel with you on the cruise portion of your vacation and will held lectures, tasting and will introduce you to food and beer pairing. Continue your European vacation with a high-speed train transfer to spend 3 nights in Paris—“The City of Lights.” Enjoy guided sightseeing of this iconic city, and spend another day at your own pace to experience the wonderful cafés, museums, and legendary cityscape in the most romantic city in the world. Your Local Host® is available with recommendations and assistance in making the most of your free time in Paris—as part of your Monograms Paris vacation package.